Autumn is well on its way here in Paris. Most of the trees have turned yellow and winter veggies like squash, pumpkin, cabbage and Brussels sprouts have taken over the markets. That means oatmeal season has come to our house and I’ve been making lots of it lately. I tend to reserve it for calm, at-home mornings, but since it’s so easy to make I’ve even made it a few days before heading to work. I remember oatmeal being more difficult to find when I first came to France (in 2000) and even when I came back for good (in 2004). You had to know which stores carried it. Now, just about any grocery store sells rolled oats and you can find a variety of organic versions in the numerous health food stores which have sprung up in the last few years. Instead of always using simple rolled oats, I sometimes like to use a combination of cereals. 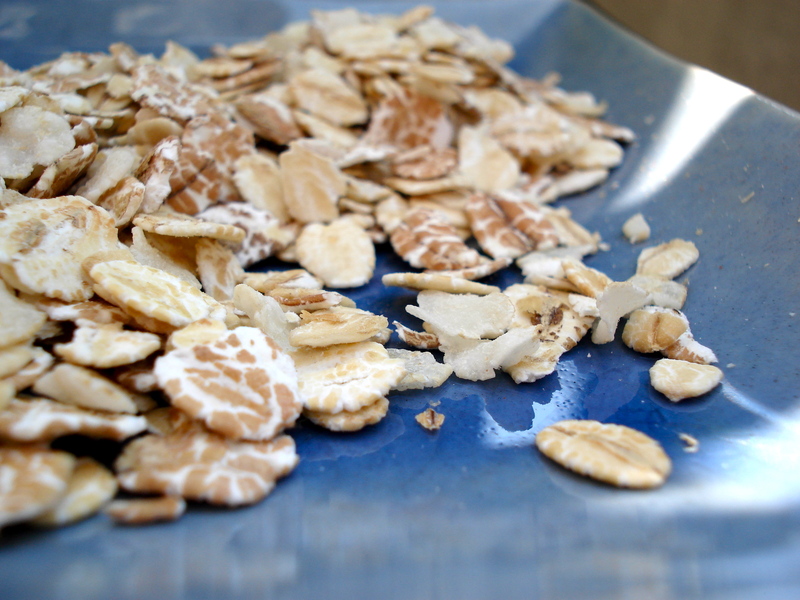 Naturalia, for example, sells a package of 5 different grains: oats, wheat, barley, rye and rice flakes. I just cook it up like regular oatmeal, ending up with original flavors and a variety of nutrients. Oatmeal itself is pretty basic, so the fun comes from both how you cook it and what you put on top. The simplest way to cook oatmeal is by pouring some oats into a saucepan with some water and cooking over medium heat (while stirring) until they’re cooked. I never measure anything and usually have to add some water along the way. Or, you can do like an English friend of mine and use milk instead of water. Once the oats are cooked, she doesn’t put anything on top. The milk itself gives a slight sweetness. My real secret (which I learned from my younger brother) is to let the oatmeal sit, covered and off the burner for a few minutes before serving. This gives a fluffy texture to the cereal and makes it just perfect. As for the toppings, my favorite it simply a little maple syrup, cold milk, bananas and strawberries (when they’re in season). Honey or brown sugar are also good sweeteners. I’ve put all sorts of different nuts (slivered almonds, walnuts or even Brazil nuts are nice), ground flax seeds, cinnamon, raisins, dried cranberries… so many options. For a real treat, do like my older brother used to and drop in a bit of salted butter with your brown sugar for a sweet-savory taste, or scoop some cinnamon ice cream on top as our favorite restaurant did when we were kids. 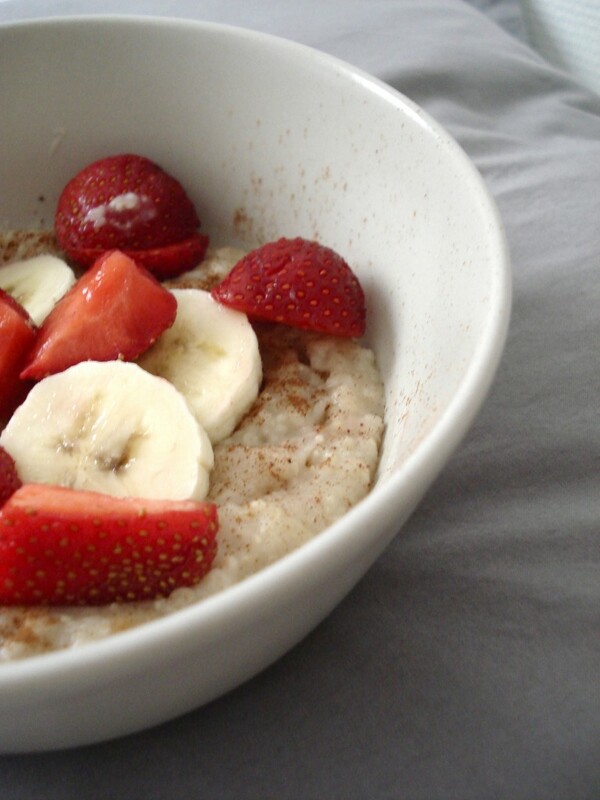 Everyone has their own special way of eating oatmeal – and some days it just depends on what you feel like. How about you, how do you eat your oatmeal? This entry was posted in Recipes (All), Recipes (Vegan) and tagged brunch, fruit, nuts. Bookmark the permalink.